Walking to benefit breast cancer research, Wendy is a fully articulated, 8 inch vinyl doll with green eyes and red braided pigtails with bangs. Always fashionable, she walks for this important cause in a hooded, zip-front pink sweatshirt and pants. Beneath her sweatshirt, she shows off a pink knit tee featuring the CancerCare™ logo. Pink ribbons on her pigtails, white socks and pink sneakers complete her look on the day Wendy Walks For Cancer. 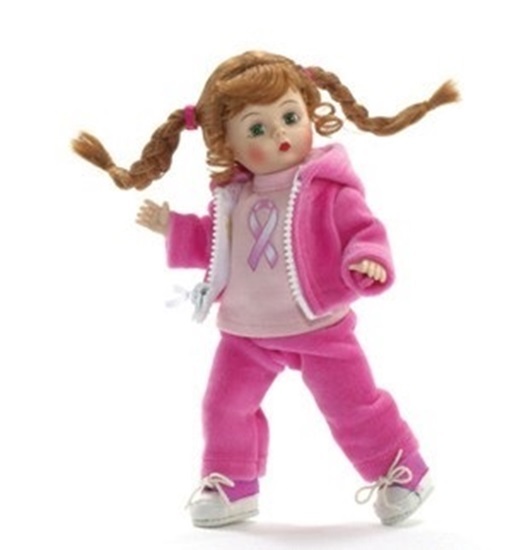 (note: The Alexander Doll Company donates a portion of the proceeds from this doll to CancerCare™). Suitable for ages 14 and up.